With both E3 and Gamescom under our belts, and the hysteria of the winter games release season about to lay waste to our bank balances, we've had a little time to sit back and digest all those new games Microsoft and Sony rammed down our throats with pre-rendered trailers and ever-awkward on-stage demos. We all know why the big publishers rely on these tentpole releases - franchises such as Halo and Gears of War are proven big sellers, with huge budgets and multiple studio setups to keep them ticking over, but each and every one has become a tired old thing, bloated from over exposure and brand saturation. 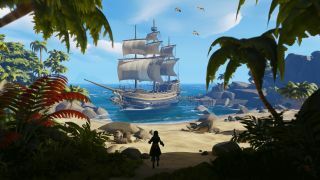 Microsoft wanted us to get all gooey over the grittier take of Gears 4 with its turgid Fenix dynasty, yet all we wanted to hear about was Rare's freshest slice of interactive fun times, Sea of Thieves. We all like the warmth of familiarity, but it works best when it's a series we haven't seen for a long while - take the return of Killer Instinct in 2013 or the revival of Shenmue last year. These franchises meant something and didn't have their star power ground to dust by too many iterations, year-in, year-out. Even Ubisoft, a publisher that pumps its known quantities for all their worth - that Tom Clancy name tag is still defecating dollars with every year, after all - has had some of its biggest hype in the last few months from For Honor and Steep. Two brand new games that thankfully don't contains the words 'Recon' or 'Splinter'. So, with three years under the belt of the current generation already - and a new, semi-console cycle already kicking off with Xbox One S and PS4 Pro - there's never been a better time to invest in the new, the fresh and the unknown. Recore is one such title - a double-A throwback to a bygone era of action-adventure gaming. Sure, it's a little bit flawed (as the recent previews and current reviews are picking out), but it was a world we've never explored before in a genre that's filled with the familiar. Sunset Overdrive had its flaws, and plenty of detractors too, but it was still one of the most enjoyable new open-worlds I've ever played, one that took the world 'fun' and distilled it down to its purest form. Will we see another one? Probably not, but at least we got something other than a new Ratchet & Clank (which Insomniac went straight off to PS4 to develop. Sigh). Let's not forget some of the most loved and lauded games this year have been brand new games. Sure, many of them were multiplatform, but the power of a brand new IP can't be denied. Inside was a triumph, one that pulled the heartstrings as much as it proved familiar ideas could be made fresh again with innovation. Or Unravel. How amazing was Unravel? Yeah, it was a little dude made of yarn jumping around memories, but it was something we'd never seen before and it's magic felt all the more potent for it. New IPs don't always pan out - just look at the amount of time and investment that was poured into The Order: 1886. Planned as the next big first party IP, one to inherit the throne from the likes of Uncharted. Yet it bombed, critically and commercially. Those kind of losses hurt, especially when it comes to the return the big publishers expect on a pre-planned triple-A title, but they're part of the process. Not every new game sticks and some are outright failures, but the fact they exist is good for games and the industry alike. Now it has a piece of console hardware that it is treating like a running joke, the big M is in a perfect position to replicate what it did with XBLA back on Xbox 360. Take risks. Push new games from new studios. Be the platform that welcomes experiences you haven't seen before. Sure, we'll have to endure another Halo every few years, and God knows how many Gears of War and the continued story of the Fenix bloodline, but it'll be worth it just to see all the new experiences that thrive in between.